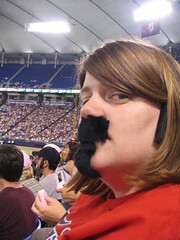 Tonight was Joe Mauer Sideburn Night at the Twins game. The sideburns weren’t enough for me, so I decided to use the patches of fur for other facial decoration. This has led me to one conclusion. If I were a dude, I would totally have facial hair. I could not top touching it. I’m considering doing reviews of beard oil so I can touch more beards. It might get weird. It may have looked slightly odd. And for that, I should probably apologize to the other 30,000 fans that were there tonight. Except for the girl that had to go to the concession stand eight times. I’m not sorry to her. You are hilarious! You are fun to be with! Those pictures crack me up. Did the mustache and beard interfere with the beer? 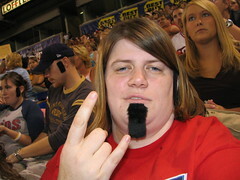 The soul patch totally becomes you.